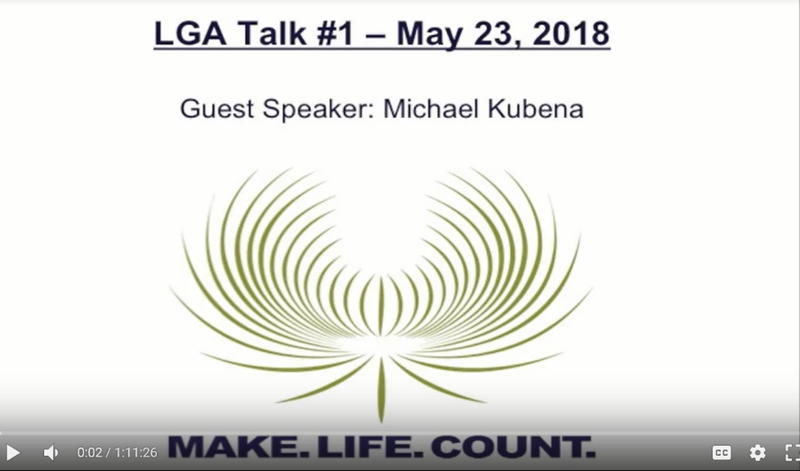 On May 23, 2018 we hosted our first ever LGA Talk, featuring Michael Kubena as the guest speaker. We began by kicking off the LGA Talk Series with an explanation of the mission behind these conversations, helping to jolt people into new thinking, to encourage action today vs waiting for later, and to feel the support of a full community that is here for support. Mike spent 25-30 minutes speaking about some of the key moments in his life, growing up in a small town in Texas, rising the ranks to eventually lead an 8,000 leading professional services firm in Eastern Europe, to eventually walking away from it all and remaking himself today. Thereafter, he fielded 30 minutes of Q&A, as our audience of 75 people related their lives and experiences to the insights Mike shared. Altogether it was a fantastic evening, and we were so glad that so many could attend in person. We are thankful that so many joined us at this first-ever event, and that provided us some grace required to explore our first try and to improve going forward. For those of you who were out of town, we have provided a link to the 1-hour event so that you may participate as well, and we are considering live casting in the future so that you may participate and ask questions as well (please just click the LotusGroup Advisors golden leaf below and a hosted video will open in your browser). The feedback we received after the event was tremendously helpful. In general, the participants loved where we are going directionally with this series, enjoyed the atmosphere, the food, and the speaker. Probably our favorite comment came from our LGA friend Matthew Bransfield, who mentioned that we are so lacking today in physical forums for coming together, listening to a speaker and then discussing topics as a community. He was very encouraged about what we are trying to accomplish and was supportive of helping us to further improve the experience with each talk. We are in the process of organizing our second LGA Talk for late fall (late September or early October). We will be taking all the constructive criticism from above as we look to kick off our second Talk. We will also research an option for live telecast if enough of our out-of-town folks request us to do so. As a brief intro to the LGA Talk, Tom was a corporate lawyer who provided well for his family but wasn’t enjoying his career path / choice. He was a bit “stuck.” While many of us remain stuck (jobs, relationships, health issues, etc), Tom figured out a way to face his fears and make a change, all the while living up to his family obligations. He eventually linked up with a small company called Popsockets, made an investment, was installed as the new President and grew the company to worldwide recognition…we even have an LGA styled Popsockets today! Stay tuned – our save-the-date will be coming out in the weeks ahead!! !